SulliVANS Portable Storage offers an alternative to high priced moving company moves and to commercial storage needs. We all know that the cost of moving can be astronomical. SulliVANS Portable Storage offers a reasonably priced alternative. We serve primarily the Bismarck-Mandan area, plus the entire state of North Dakota and can provide you with a full size moving van to fit your household needs. You do the labor, we do the moving. We also offer free storage of your van in our secure yard until your ready for your stuff. Then we re-deliver, you unload, and we’re done. It couldn’t be simpler. We’ve furnished furniture vans to over a thousand customers since we started our business in 1995. If you’re home sells too quick, and you’re unable to get into your new home right away, SulliVANS is the solution. Don’t want to load yourself? 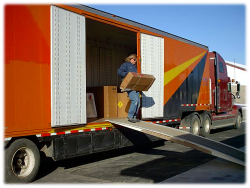 We work with several local companies who will furnish the labor to do your loading for you. "The customer loads it, we pick it up, and re-deliver it to the new home. The customer unloads and it's done!" 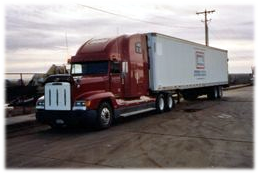 SulliVANS Portable Storage also furnishes freight vans to commercial customers from 26’ to 53’ in length. It’s literally a Warehouse on Wheels and is a great solution for seasonal stock and for long-term storage of in-house stock or transient freight plus construction equipment on site. In-state delivery is also available for construction companies for on-site secure storage. With a total inventory of over 150 semi-vans, SulliVANS Portable Storage is ready to help in your storage needs.